Goat Cheese and I have long been at odds over whether or not I should continue trying to find a brand or flavor I enjoy. It has taken me several failed attempts to find the one that agrees with my taste buds. The cheese that I discovered at Whole Foods is produced at a Maryland Farm. I found it to be the right balance of creamy with a mild flavor that is unique to goat cheese. I can't quite find the right word, it is not sour or tart; astringent might be too harsh to describe something that should be appealing to our culinary desires. I believe the word I am looking for is puckery. Goat cheese causes my cheeks to pucker and my mouth to water, reminiscent of a lemon wedge. For this reason I have struggled to find a goat cheese that I enjoy. Cherry Glen Goat Cheese Company has a wide range of goat cheese available to the public. I am not sponsored or being asked to write about this company. In my mind, to find something that has made me reconsider my outlook on goat cheese is deserving of a shout out. I decided to combine the goat cheese with artichoke hearts, red bell pepper, chives, parmesan cheese and zucchini. The filling is rich, creamy and full of flavor. Tomatoes and mushrooms come in a variety of sizes. You need to decide what size you want your guest to enjoy, one bite or two, and possibly more if you go to a larger variety. For my pictures I tried to find those that were close to the same size. It makes me happy to see a plate of tomatoes or mushrooms that are balanced and uniform, maybe my OCD slips into the kitchen every once in a while. Of course you would need to look at your menu and decide if you need or want a hot or cold appetizer to serve. Ultimately the decision would need to be made based on your guest list, menu and time allowed to prepare your menu. The filling can be prepared up to two days in advance. The mushrooms and tomatoes can both be filled the day before and stored in the refrigerator covered. 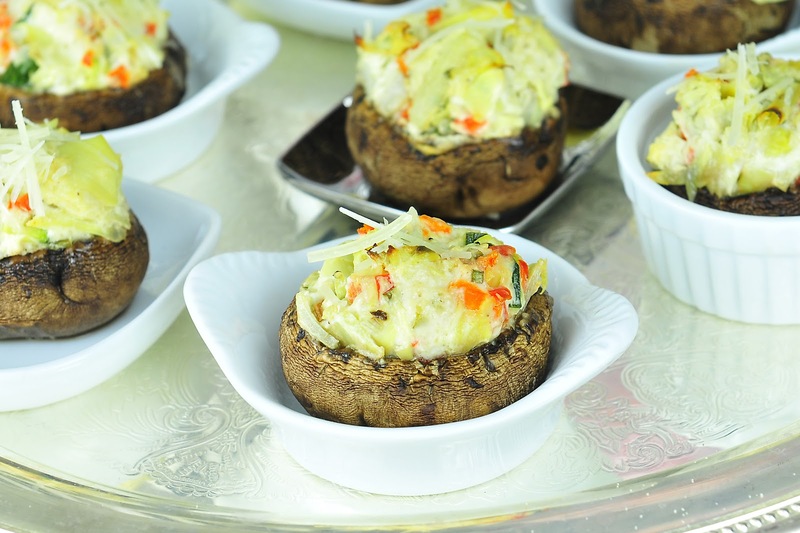 The mushrooms should be baked and served right before you and your guest are to dine. Serving the two items is easy. The tomatoes are a bit more challenging because they may not be flat on the bottom; they will have a tendency to roll around the plate if you do not secure them. I chose to pipe a bit of sour cream. This will "adhere" them to the serving tray. 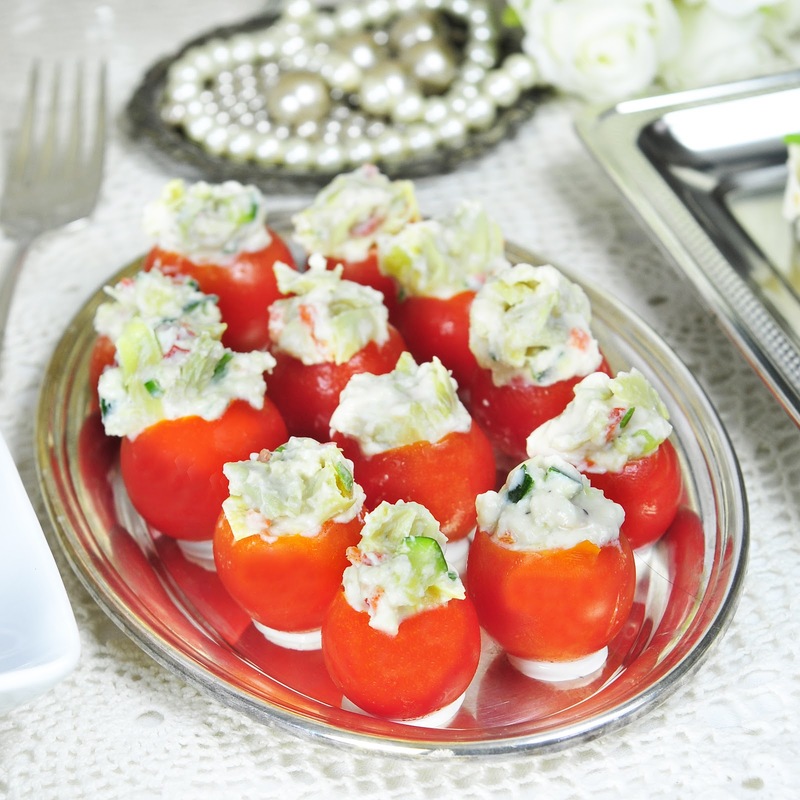 It works well, does not affect the flavor of the appetizer, and adds a design element to the presentation. I used cute individual ramekins that I found at a cooking store to serve the mushrooms to my guest. This quick amuse-bouche filling will be made again, with the same goat cheese mentioned above. To say that goat cheese made the dish might be a far reaching idea-- all of the ingredients combined added to the whole recipe-- but it has elevated goat cheese up the ladder of foods that I now enjoy. It took time for me to appreciate its unique flavor but I am glad that I kept going back to the cheese counter in search of something that worked for me. Are you one to keep trying a specific type of food if you don't like it the first time around? If so, what was it? What changed for you: texture, type, preparation or brand? Makes 1.5 cups of filling. Dice up artichoke hearts. If you find a tough leaf;remove it. Combine above ingredients together until well combined. This dip is excellent used in mushroom caps and baked at 350 degrees for 30 minutes or served cold in hollowed out tomato cups. Filling can be made up to 3 days in advance. The tomato cups and mushroom caps can be prepared the day before. Heat and serve mushrooms right before party begins. To anchor tomato cups, I used a dab of sour cream on the plate to keep them from rolling around the plate. I am loving these! Stuffed mushrooms are one of my favorite appetizers and really, I could just eat them like a meal. Love the artichoke and goat cheese filling in these. You've taken 3 of my favorite foods and created the ultimate appetizer. 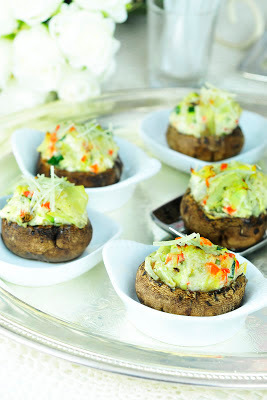 And I bet they're healthier than traditional stuffed mushrooms with all those veggies in there. Definitely bookmarking these! Thank you Kate! I am thrilled that I finally found some goat cheese that I enjoy. Sherron, these look amazing. I think I could just cope and paste what Kate wrote right here - my faves! Pinning! Hi Sherron! This is a great idea! I love to serve amuse-bouche before dinner commences... Elegant and impressive! Thanks for sharing this. Stuffed mushrooms are a hit with most people, but I love that you tried this with the tomatoes for those that aren't mushroom fans. Looks delicious! It sounds delicious, and I adore the tang of goat cheese! What a fantastic mix of ingredients! 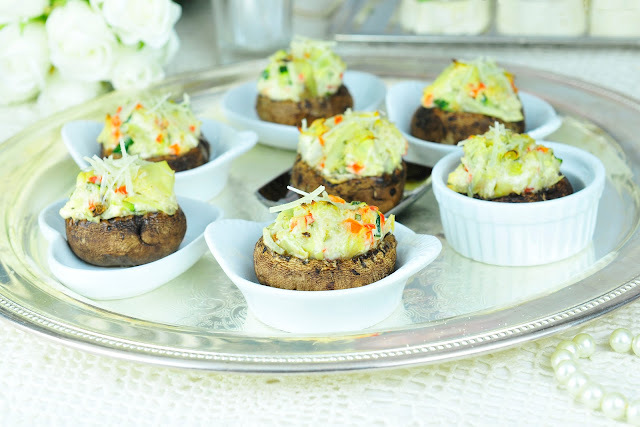 Stuffed mushroom caps are one of those party items that I just can't resist. I will have to keep an eye out for that goat cheese at our Whole Foods.